There are many wood craft ideas to be discovered. I want to give you some of the best ideas here (I hope!). You can buy wood crafting kits for everything from dollhouses, to boxes, to birdhouses to model air-craft at your local craft store or simply by typing in your request at a popular search engine such as Google or Yahoo. Your local library or bookstore is also a good source of woodcraft ideas as is the guy on the corner who has a front yard full of hand-carved wooden whirly-gigs. But before you examine wood craft ideas it might help you to identify the usual purposes of the different kinds of woods. Pine is usually inexpensive and light in color. It is good for small wood craft projects such as plaques. Walnut is a dark rich wood that is good to use for making small pieces of furniture, boxes, chests and candlesticks. Ash is a brittle wood that is good for carving drumsticks. Balsa wood is very soft and light in color and often used to build model airplanes because it is so lightweight. Balsa wood is also good for wood carving as it cuts like butter. Plywood, which is really an engineered wood product is good for practical projects such as building kitchen countertops, cabinets and roofing. One of the easiest wood craft ideas is the treasure chest or box. You can make this out of any kind of wood and then varnish and stain it to your liking. You can also stencil the top of the box and paint it in wood like colors to create the effect of inlaid wood working. This is easier than cutting all the geometric pieces that you would need to create a real inlaid wood design. There are hundreds of patterns for boxes on the Internet, however one interesting wood craft idea for a box that I did run across was the Vintage Book Box at http://www.diynet.com. The cover of a vintage book is decoupaged onto a pre-bought or hand-made wooden box to turn it into a treasure chest in disguise. There are also many wood craft ideas for what are called "garden pokes" on the Internet. These are wooden plaques attached to a dowel stick that mark or label what is in your garden. Some individuals lavishly decorate these pre-cut heart shaped, circular or square plaques with handwriting and depictions of flowers and others just decoupage the cover of the seed packet to the top of the garden poke. With this kind of wood craft idea you never need be confused about what is growing in your garden again! If you are good with a small knife, then you might try carving your own small figures out of balsa wood to make holiday decorations such as a Santa or a snowman. A simple but useful wood craft ideas is to make your own rubber stamp by buying a block of balsa and carving a design (such as your initial) into the bottom of the block of wood. One of the simplest Christmas wood craft ideas is to use left over blocks or chips of wood to create fake presents that can be used to decorate centerpieces, candle centerpieces or even be hung from a tree. You can wrap the blocks of wood in real wrapping paper and tie them up with ribbons or you can paint them so that they look like tiny presents. The most rudimentary wood crafting projects involve using Popsicle sticks. Clean ones can be purchased in bulk at craft supply stores. If you search the Internet for wood craft ideas you will find all kinds of patterns and instructions for making birdhouses, log cabins and other small structures. You will also find many ideas for building dollhouses. Some of these doll house projects are big enough for the child to walk into and others are tinier than your toaster. The fun of building doll houses is the ingenious and often, unique methods craftsmen come up with to create really amazing effects for doors, windows, roofs, outside and inside decor. Your total material cost could be as low as $200 including furniture. Of course, the cost can be much higher with veneer walls, silk rugs and fancy furnishings. Doll house patterns are available from many sources - your public library probably has several books on the subject. 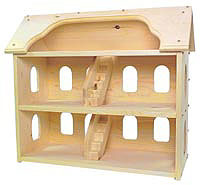 Discount book sellers also offer a wide selection of books, plans and suggestions for doll house wood craft ideas. '10 Steps To Creating An Arts And Crafts Best Seller!' is an email mini crafts business course and newsletter that is packed with arts and crafts tips and money-saving suggestions. And it's FREE!